Last major update issued on June 16, 2004 at 03:50 UTC. The geomagnetic field was quiet to minor storm on June 15. Solar wind speed ranged between 399 and 586 km/sec under the influence of a high speed stream from coronal hole CH101. Solar flux measured at 20h UTC on 2.8 GHz was 109.4. The planetary A index was 16 (STAR Ap - based on the mean of three hour interval ap indices: 16.8). Three hour interval K indices: 21534333 (planetary), 32434432 (Boulder). At midnight there were 5 spotted regions on the visible disk. The solar flare activity level was low. A total of 1 C class event was recorded during the day. Region 10631 reemerged with a single spot. Region 10632 was quiet and stable. Region 10633 decayed and was spotless, then a single spot reemerged. Region 10634 developed in the leading and central spot sections while the trailing penumbra split into two. The region has mixed polarities and a minor M class flare is possible. Flare: C1.1 at 20:01 UTC. Region 10635 was mostly unchanged in the spot layout. Unusually bright plage is still observed in the southern and central parts of the region. Polarities are intermixed and a minor M class flare is possible. 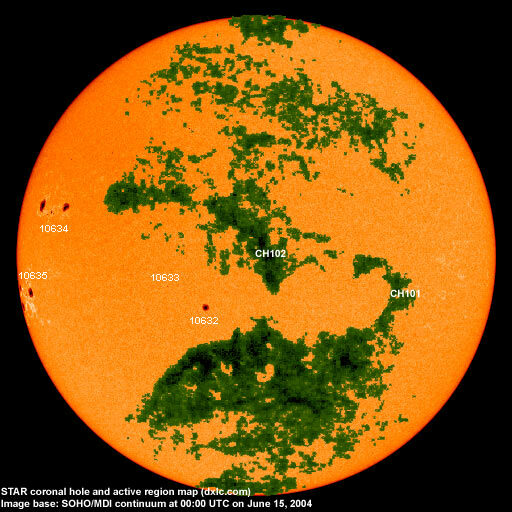 June 13-15: No fully or partly Earth directed CMEs observed. A recurrent coronal hole (CH101) in the southern hemisphere was in a geoeffective position on June 12. 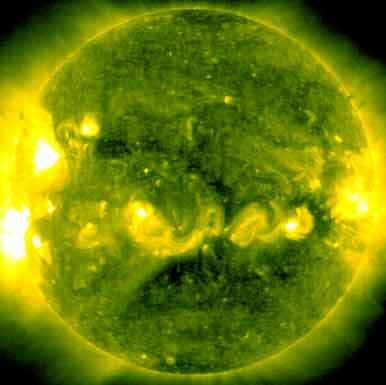 A recurrent trans equatorial coronal hole (CH102) was in a geoeffective position on June 14-15. 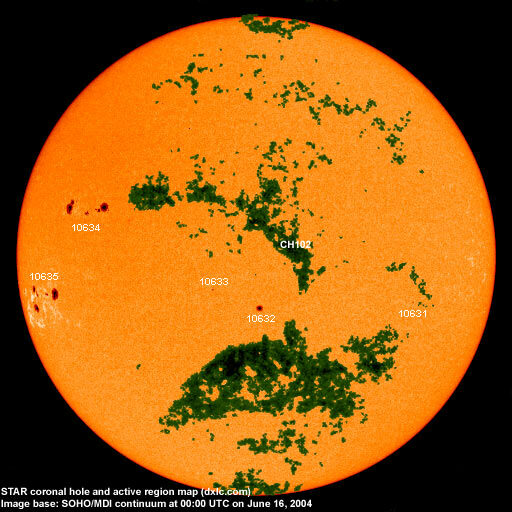 The geomagnetic field is expected to be quiet to unsettled on June 16 and quiet to active on June 17-18 under the influence of a high speed stream from coronal hole CH102. Long distance low and medium frequency (below 2 MHz) propagation along east-west paths over high and upper middle latitudes is very poor to useless. Propagation along long distance north-south paths is good to excellent. Trans Atlantic propagation conditions are monitored every night on 1470 kHz. Dominant station tonight: Radio Cristal del Uruguay. On other frequencies a number of stations from Brazil, Uruguay and Argentina were noted. Argentina was best on 710 (Radio Diez) and 790 (Radio Mitre) kHz while the best signals from Brazil were on 740, 930, 980, 1010 and 1440 kHz. Stations from Uruguay had an unusually good night with nice signals on 850, 1480, 1510, 1570 and 1580 kHz. Two stations were noted on 1520 kHz, one of them was Radio Chascomús (Argentina), the other one had talk only and was probably from Uruguay. Propagation was best from local sunrise and over one hour afterwards. No North American stations were observed.